Seeing it firsthand; experiencing it directly: the majestic scope and depth of it ~ the full impact and implications of it ~ the full enormity of the interdimensional agenda: it is an overwhelming, illuminative, and transformative experience ~ an immersive, transcendental voyage into exotic, ultra-futuristic, extraterrestrial landscapes ~ into metaphysical, hyperdimensional etherealities.... It is the realization of the mysterium tremendum et fascinosum of existence ~ the inescapable ultimate truth ~ in which preeminent, supernatural, fifth-dimensional apotheonic beings of light actually exist and have been monitoring, cultivating, and perfecting human beings ~ human souls ~ from the very inception of the human race. They hold in their hands providence ~ our destiny, our very lives. It is humbling and bewildering ~ intimidating and intriguing ... After several months of guidance, interplay, and spiritual communion, we came to realize who they truly are: the ancient angelic overseers ~ rulers of the stellar orders.... imbued with implicit authority ~ formidable supernatural powers ~ and ultra-advanced technologies.... allowing them to extend human life indefinitely ~ bestow immortality upon all deemed worthy ~ the everlasting, supernatural, rhapsodic life ~ far beyond the conclusion of our physical sojourn ~ the expiration of our corporeal "containers." ​Through entheological metaphysical esoteric technologies we enter into transformative processes of regeneration, and illumination ~ we are elevating, equalizing, and attuning the vibrational frequency of our being with the higher harmonic resonance of interdimensional, supernatural, godlike, extraterrestrial hyperintelligence from primordial hyperspace realities. Only through integration, consubstantiation, and assimilation into the living, superconscious, ethereal, hypernet of cosmic interconnectivity are we transformed into fifth-dimensional beings of light. ​As our ecstatic state of expanded, universal, transcendent consciousness accelerates into higher celestial planes of existence, we no longer need to inhabit dense, three-dimensional forms. As we journey beyond the ego, the mind, and the gross physical plane, we are transformed ~ into ethereal, superconscious, interdimensional, hyperphysical Light / Energy beings... As our perception fully extends into the fifth-dimension ~ as our enlightened consciousness expands and unfolds ~ ​our physical body is automatically transmuted into its higher fifth-dimensional expression. ​​Ego-dissolving, transpersonative, entheogenic, spiritual methodologies allow us to transcend superficial mental / physical constructs, the false-persona, and the evanescent pleasures of the world.... Perception can be extended ~ awareness altered, expanded, and transformed. As the vibrational frequency of our consciousness is synchronized and attuned with hyper-evolved, godlike deiforms from ethereal hyperspace realities we fall into equilibrium with the subatomic electromagnetic fabric of time and space ~ the fundamental harmonics of the universe ~ ​the living primordial field of God-Consciousness ~ the hyperdimensional superconscious intercollective ~ existence itself. ​As we enter transformative esoteric supernatural processes ~ alternative paraphysical hyperdimensionalities ~ we are reborn as ethereal superconscious beings of Light. The only criterion is that we take a genuine interest in their transcendental way of life: surrender, acquiesce, and take a quantum-leap beyond the illusory world of the mind ~ the cosmetic, one-dimensional, quasi-reality matrix of the ego-self ~ into a life of omniscient superconsciousness ~ a luminous, transpersonative, fifth-dimensional reality, and become apprentices to the spiritual Way of God. ​As our chakral energies become centered, balanced, aligned, and unified with the Whole: we become aware of the partial, delusional, quasi-reality paradigm ~ the hallucination of western culture, which we experience through the apertures of our physical senses, through the distorting prism of three-dimensional space. 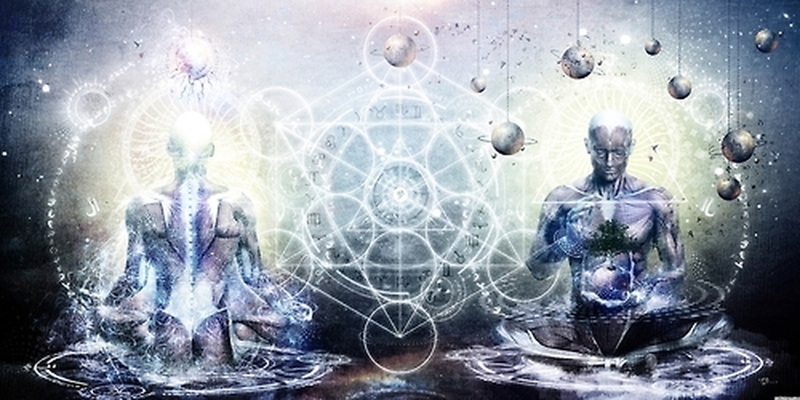 As awareness expands, evolves, unfolds: we dissolve into the infinite transcendental living moment ~ the Pure Void of Nothingness ~ into the ethereal oceanic field of interconnectivity... It is an epic mystical peregrination to the innermost cosmic depths of being ~ to the true nature of our consciousness. We experience unimagined transport to alternative hyperspace realities ~ to rhapsodic states of spiritual intoxication. We are spiritually awakened into ecstatic states of luminous transcendental hyperconsciousness ~ we experience the full-spectrum multidimensional bandwidth of existence ~ the correct perceptual imaging of Ultimate Reality. Perception altering transpersonative entheogenic technologies allow us to synchronize, harmonize, and align consciousness, that we may temporarily exist in the same elevated harmonic spiritual frequencies as supernatural, hyperdimensional, extraterrestrial beings of light we typically encounter ~ whose natural environment is a mystical psychospiritual elusive landscape of ineffable symbols, images, metaphors, and transcendental objects ~ normally inaccessible and unrealizable ~ beyond the scope and capacity of ordinary unilluminated human consciousness. But this is possible only if we arrive at ancient, esoteric, mystical realizations ~ allowing us to reach a deeper level of metaphysical / existential / spiritual understanding ~ accelerating the enlightenment and transformation of our consciousness ~ the illumination of our intelligence ~ quickening the harmonic resonance of our being . . . to such a degree we could ostensibly become worthy of receiving their attention ~ their acknowledgment of us ~ resulting in their inevitable attraction to us. This is possible only through exploring the mysteries of Christ-Consciousness. ​We are being extended a rare opportunity to enter higher planes of consciousness and existence ~ to realize the infinite universal cosmic-self and explore hyperdimensional realities ~ experience the genuine spiritual awakening, transformation, and rebirth ~ embark on a mystical voyage that transports us beyond the limiting filters, distorting lenses, and narrow confines of our egocentric intellectual framework ~ the misleading perspectives and pseudo-realities of the mind. You will be entering a higher spiritual harmonic ~ an ecstatic, enlightened Life of a higher order . . . the pure, unadulterated, apotheosized Way of the innermost core of existence itself . . . difficult to master, but the rewards and benefits are simply out of this world. Remember: the hyperdimensional overseers are only attracted to and capable of interacting with those who have endured the purifying fires of transformation ~ who have successfully changed their primary source of life-energy from extraneous elements of the physical plane ~ peripheral inutile material possessions of the world ~ sensorial pleasures of the flesh ~ egoistic power-trips over others . . . to simply dissolving the experience one's self into the infinite sky of Zen ~ transcending the ego-mind ~ becoming an ecstatic state of pure universal love-consciousness. You see “I” or “me” NEVER achieves peace, freedom, or bliss ~ the ego-self NEVER attains the divine inner kingdom of heaven ~ a life of spiritual transubstantiation ~ of ultimate existential truth. Freedom FROM “I” and “me” is what the case actually is... Only then are real spiritual treasures available to be experienced. * To begin developing and simplifying a process of hyperintuitive interconnectivity to the innermost cosmic depths of the souls omniscient wisdom and guidance ~ that we may begin penetrating and exploring the ancient, esoteric, unfathomable mystery of the interdimensional, extraterrestrial, supernatural, UFO, hyperspace phenomenon itself.... that in the final equation we will inevitably initiate processes of intuition, exposition, and revelation as we unravel the great mystery of who we actually are... as well as who these godlike transcendental hyperintelligent etheric beings of light ~ these ancient elusive overseers ~ rulers over the earth, the stellar orders, and the human race ~ from our very inception ~ truly are. * That through sutras, meditation, ecstatic states of transcendent awareness, and entheogenic methodologies we might begin perceiving and accessing the living, hyperdimensional, telegnostic, ethereal field of interconnectivity ~ a superconscious intercollective singularity ~ that exists in our very midst ~ just beyond the attenuating, distorting lens of the mind. * We are researching, developing, and investigating spiritual technologies, that are proving to be highly efficacious in promoting and triggering immersive interactive experiences into the immediate, supernatural, interdimensional, extraterrestrial, psychedelic phenomenon. * We live in a fluid, dynamic, interactive/experiential, extemporaneous atmosphere of developmentation, analysis, and experimentation with holotropic methods of ego-dissolving yantras, mantras, and meditations ~ with a broad-spectrum of organic, mind-expanding spiritual technologies ~ designed to trigger and enhance mystical processes of illumination, transformation, and the realization of the universal-self ~ with epiphanic spiritual awakenings into the primordial, all-permeating, supernatural, metaphysical, living ethereal connexus of an underlying, subatomic, cosmic-energy radiant ~ the transcendental, hyperdynamic, integrative, reality-matrix of God-Consciousness. * Members of the Interdimensional Spiritual Collective Project religiously, reverently, piously and collectively enter into esoteric mystical processes of purification, regeneration, transformation, enlightenment, and spiritual rebirth ~ into deep immersive interactive explorations into the primordial, subatomic, hyperdimensional, extraterrestrial, UFO phenomenon.... that we might begin living in the organic, superconscious, intercollective hyper-reality-matrix ~ God's living, primordial, all-encompassing, integrative field of love-energy consciousness. * Through spiritual technologies developed and pioneered by the S.C.P. we are able to dependably teleport to the ecstatic, hyperdimensional, superconscious, spiritual, unity-field intercollective ~ the divine cosmic-energy vortex of Blissfulness, Consciousness, and Truth ~ Oneness, Completeness, and Interconnectivity ~ Indra's Net of Jewels. * Esoteric knowledge is embedded in the path of Self-Realization. Passing through trials and afflictions ~ suffering and misfortune of the physical plane advances one through stages until one enters transcendence, enlightenment ~ the full realization of the Oceanic Consciousness of Christ. ​Some primary imperatives, prescripts, and tenants of The Interdimensional Spiritual Collective Project include informing, instructing, and preparing the apprentice for a life of esoteric spiritual technologies, ecstatic states of hyperawareness, and transcendental meditation. As we interconnect with God, Ultimate Truth, and higher planes of existence, we learn to live in faster moving harmonic frequencies ~ altered states of perception ~ supernatural hyperdynamic fields of expanded hyperintelligence.... we speak in secret subatomic energy languages.... This is an odysse into deeply profound mystical visions ~ theopneustic entheological spiritual insights and realizations ~ into enhanced states of consciousness and altered perception that can alter the fabric of space, time, and reality itself... it is an epic spiritual journey into the unfathomable depths of the universal cosmic-Self ~ the infinite living matrix of luminous subatomic quantum entanglements within the oceanic Consciousness of God. Communication within the fifth-dimensional subspace matrix is difficult to encompass, understand or convey through conventional verbal articulation ~ primitive auditory expressions ~ the anamorphic, pathological thought processes of the human mind ~ through the superficial, inconsequential sophistry, speciousness, and dialectics of "rational" intellectualism.... through our meaningless, self-serving, narcissistic dreams and fantasies ~ ideologies, stratagems, and platitudes which have come to dominate our internal cognitive landscape. Within the ethereal transcendental cosmic hypernet of interconnectivity is a galaxy of information which cannot be comprehended or interpreted through our closed, linear, one-dimensional, subcelestial thought processes. This has primarily been the consequence of people losing touch with their primordial hyperdimensional spiritual roots ~ the higher levels of Christ-Consciousness. ​People of the modern era have forgotten how to communicate through the language of the heart. ​​In our modern culture of addictions and distractions ~ ambitions, desires, and careerism ~ of existing in a perpetual, egocentric state of hyperconsumerism ~ we have become disconnected from the spiritual core of our own being. ​​The archaic psychedelic logos is a language telegnostically experienced at the deepest cosmic levels of being.... It is processed through the heart ~ through universal consciousness ~ not casuistic mental rationalism.... Through the translinguistic intention of the psychedelic experience we are unified into the integrative Aquarian-consciousness paradigm ~ the symbiotic, theopneustic, hyperdimensional intercollective of oracular mystical expositors ~ where voyagers into alternative hyperspace realities ~ into the entheological, hyperintuitive, transformational experience learn to master the art of living in transcendent states of ecstatic universal hyperawareness. Through the ancient, all-permeating hyperintelligence ~ the archaic wisdom ~ of the omniscient, superconscious, living multiverse we are able to perceive, interconnect, and communicate with nature itself through the Gaialanic logos ~ revealing the laws and forces guiding the cosmic energetic hyperdynamics ~ even the spiritual aspects of hyperphysical existence ~ the numinous. * We are trying not only to advance the transcendental Way of life of our interdimensional overseers, but to attain a state of spiritual balance, synchronicity, and harmonic homeostasis with the ancient avatars of light. It is toward the salvation of our very lives that it is expedient to gain the favor, acceptance, and approval of those above us. * We are attempting to surround ourselves with as many spiritually awakened, transformed human beings as possible before we leave the physical realm: creating an awakened community ~ a superconscious spiritual family intercollective of hyperintuitive explorers ~ able to see and perceive full-spectrum-reality... who are familiar with, have a complete experiential understanding, (not just intellectual), and working knowledge of the primordial fifth-dimensional transcendental integrative reality-matrix ~ the universal cosmic-energy-radiant ~ the full-spectrum of multidimensional spiritual hyper-reality... who have regular interaction, visual sightings, and communion with the ultra-advanced ethereal interdimensional beings who live in hyperdimensional reality... who, by the way, are right here among us ~ forever in our midst ~ from here to eternity. * We only need to be among like-minded spiritual friends, who we share a common interest with.... And what is more interesting than full-immersion into the UFO / hyperspace phenomenon?.... What is more stimulating than discovering and exploring alternative hyperphysical landscapes...? witnessing and interfacing with ultra-advanced technologies, interdimensional spacecraft, and engaging in various kinds of interplay with godlike deities? It is not just for thrills, or fun and games, my friend.... if this comes to you at all, it will come at a great price. They demand great sacrifices in order to be accepted into their family, enter into their world, and receive what gifts they have to offer. We are not interested in your money or your physical assets ~ your worldly desires or egoistic power-trips ~ these things have little value, meaning, or currency in hyperspace reality, and you will be expected to transcend all of this nonsense ~ that is the cost. For some people it is difficult to let go at first, but it is very liberating, and after a while, you will not even miss all of that junk. Against the backdrop of eternity, it is essentially meaningless.... You will eventually come to see it as a huge waste of time that nearly cost you your REAL LIFE ~ your very soul. We Have Photographs, We Have Films, We Have Expert Witnesses...What More Do You Want? We Can Prove These Objects Exist. We Are Past The Point of Proving They Exist. The Question Now Is Why Are They Here And What Do They Want. * All I ever really wanted was to be around my own kind ~ those who I share a common spiritual way of life with. We've been looking for such individuals for over twenty years now, and with the exception of the ancient angelic hyperdimensional deiforms themselves, who revealed themselves to us in 1999, such individuals appear to be in very limited supply. The elders have informed us, there are only three humans who they consider to be genuinely enlightened walking the earth today.... Therefore, starting with the unawakened, the unilluminated, the unevolved we are attempting, through holotropic, entheological, spiritual technologies, to trigger processes of awakenment, evolution, and transformation ~ to help apprentices realize the higher Universal-Self ~ the Oceanic Consciousness of Christ ~ their full spiritual potential.... ultimately bringing to fruition a highly charismatic, spiritually enlightened, superconscious intercollective. ​* As I was becoming aware of alternative realities ~ as the interdimensional beings of light revealed themselves ~ I was sure there must be dozens of enclaves or communities filled with awakened people who had become aware of ULTIMATE TRUTH ~ the BIG PICTURE.... so why should it be difficult to locate them? As years went by I began to suspect that the existence of truly enlightened contactees involved in the development of interactive / experiential programs with the interdimensional angelic overseers may be something of a novelty.... therefore, if I ever wanted to experience full-immersion in the hyperdimensional superconscious singularity ~ enter into spiritual communion with supernatural, fifth-dimensional deiforms ~ as part of a spiritual collective of hyperspace explorers ~ I would be initiating such a project myself.... Hence, I have been developing, evaluating, and introducing this project in an attempt to create an intercollective of spiritually enlightened people by accelerating the expansion and evolution of human consciousness through a synergistic confluence of entheogenic, perception-altering technologies. * We attempt to create consciousness ~ fully conscious humans. We attempt to create hyperconscious spiritual beings out of some of the sleep-walking, mesmerized zombies who currently inhabit this physical realm ~ those who live in a neurotic, delusional, unconscious, ego-mind state without realizing it.... They have never experienced a state of "hyperconsciousness," in which full-spectrum, multidimensional reality is experienced.... It is exactly like the movie "The Matrix," only the incubators are not necessary. I do not mean to insult anyone’s intelligence, but in order to WAKE UP it will be necessary for you to see and experience the full-spectrum of Ultimate Truth. ​* We enjoy creating states of spiritual ecstasy ~ love-consciousness ~ within our aspirants... where moments earlier there existed only blindness, sensorial pleasures, and the myopic ego-mind ~ carnal attraction, absorption, and dependencies. We truly enjoy escorting new explorers out to remote areas to "skywatch" with them, as the elders, with interdimensional hyperdynamic shape-shifting glorified bodies, reveal themselves to the new apprentices, in various forms, shapes, and geometric configurations: saucers, triangles, spheres ~ ultra-advanced, hyper-morphic, interdimensional spacecraft... there is truly nothing better than to watch someone’s face as they witness transdimensional aerial phenomena for the first time ~ observe, as profound, paradigm-shifting, existential realizations wash over their faces.... And after assimilating the enormity of the events they have just witnessed and experienced, they suddenly realize there really is nothing to fear – (because obviously, these extremely advanced and powerful entities could have vaporized, exterminated the whole lot of us long ago . . . or enslaved the entire human race eons ago). The newcomers usually break out in spontaneous dancing and celebration – jubilation that goes on for many days, and they keep calling us on the telephone every 30 minutes or so with questions about the terrible, majestic, overwhelming deiforms and phenomena, which they have experienced. And at some point the realization sinks in: that it may even be possible to be adopted into the hyperdimensional spiritual family intercollective ~ to be given a translucent hyperphysical glorified body, like they have, and live forever in a state of bliss-consciousness, as they do. * We earn standing, honor, and credit with the elders for bringing new initiates into the project. This is the most difficult thing there is in life: to earn approval, acknowledgement, and standing with the ancient interdimensional overseers. When one dissolves, disappears into his or her spiritual work ~ the spiritual mission you were meant to accomplish ~ one is blessed, not only with free spiritual energy from the primordial unity-field Itself, but also with acceptance and recognition... bonds are strengthened with the members of one's holy spiritual family. Expressions of fifth-dimensional spiritual phenomena. It is an epic spiritual journey beyond the mind into the primordial subatomic foundations of the universe that requires years of spiritual preparation: mystical visions, revelations, and hyperintuition ~ transformative full-immersion experiences into the interdimensional, UFO, hyperspace phenomenon ~ direct telegnostic interplay, illuminative hermeneutical instruction, indoctrination, assimilation ~ intercommunion with ancient denizens of the hyperdimensional superconscious intercollective spiritual family before one can be seamlessly syncretized and assimilated into the faster moving harmonics of the higher spiritual planes. As we discover, experience, and interface with deeper, more meaningful, rewarding, and dynamic interrelations with hyper-evolved, extraterrestrial, supernatural lifeforms ~ the etheric superconscious hyperdimensional spiritual family collective ~ we are indoctrinated, assimilated, and adopted into alternative spiritual hyperspace realities within the infinite hyperdynamic living universal field of the consciousness of Christ ~ the primordial transcendental integrative singularity. All hyperspace explorers, psychonauts, and seekers of existential/spiritual truth are invited to set sail with us on a mystical voyage beyond conventional, three-dimensional time and space ~ beyond the illusions, distortions, and misrepresentations of the ego-mind ~ beyond the boundaries, narrow confines, and limited parameters of this ambiguous, misperceived, telluric physicality ~ an incomplete, circumscribed, high-density electromagnetic field of atomic/molecular kinetic activity ~ only one channel on a multidimensional cosmic bandwidth... afforded to us through our abstract dialectical intellectual processes and physical senses. The sudden awakening into a mystical, hyperdimensional, visionary life ~ a life of deep interconnectivity, higher-harmonics, and divine-unity with ultra-advanced beings of light from a fifth-dimensional ethereal hyper-reality... the sudden realization that you are being absorbed into the phenomenon itself ~ becoming an integral part of the full-spectrum multidimensional spiritual reality ~ transfigured into a quintessentially new transcendental, supernatural, hyperdynamic, spiritual creature... it is going a bit further into the unknown than many people are comfortable with. ​Fear of change, fear of the unknown, fear of death are powerful psychological forces... if left unresolved they can become insurmountable barriers that prevent us from realizing our higher universal cosmic-Self ~ reaching our full spiritual potential ~ maturing into highly evolved, enlightened, interdimensional, hyperspace beings. Such unconventional, eccentric lives overwhelmed by supernatural phenomena ~ radical paradigm-shifts ~ expanded hyperawareness ~ and accelerated hyperdynamics can be challenging, difficult, and disturbing. As the spiritually unawakened approach the final chapter of their physical sojourn ~ realizing only insignificant increases in their overall psychospiritual development ~ exhibiting only a superficial, inconsequential, pretentious facade of understanding and appreciation of matters regarding existential / spiritual truth, Ultimate-Reality, and God.... the supernatural, transcendental hyperdimensionalities, higher celestial planes, and paraphysical / extraterrestrial / hyperspace phenomena, that perpetually emanates from the foundational, universal, subspace field ~ the luminous, primordial underlying, hyperdynamic matrix of interconnectivity ~ (which careerist skeptics have always managed to conveniently convince themselves to be nothing more than fairy-tales, religious fictions, and the hallucinations of mentally unstable, hyper-suggestive fanatics) ~ suddenly becomes an inevitable, overwhelming, and inconvenient truth ~ an inescapable reality ~ as unrestrainable expressions of fifth-dimensional subspace phenomena begin to unfold and reveal themselves before their disillusioned eyes. ​Because some of us recognize, that due to western societies successful efforts at psychological programming ~ perceptual and emotional conditioning ~ ​we have been deliberately misdirected ~ become hopelessly imprisoned, subjugated, and enslaved within a three-dimensional, electromagnetic, labyrinthian maze of material possessions, sensual pleasure, and egoistic power-trips... we are entangled with the world, lost in an electronic fog, addicted to the "other" and attached to inferior sources of life-energy... Therefore, we would rather not waste any more of our lives stagnating in discordant states of distraction, bewilderment, and confusion ~ any more of our time, energy, or resources unable to gain traction, purpose, and definition in our existence. There are a fortunate few among us ~ usually after suffering through years of deception and disappointment with "ornamental" blind-belief religiosity and counterfeit dead-end spiritual paths ~ who incrementally begin to arrive at something resembling epiphanic processes of clarification, evolution, and regeneration ~ who eventually arrive at higher planes of consciousness, spiritual enlightenment, and the authentic cosmic rebirth.